Today’s economic landscape is dominated by positive growth momentum but may challenge the performance of traditional investments going forward. 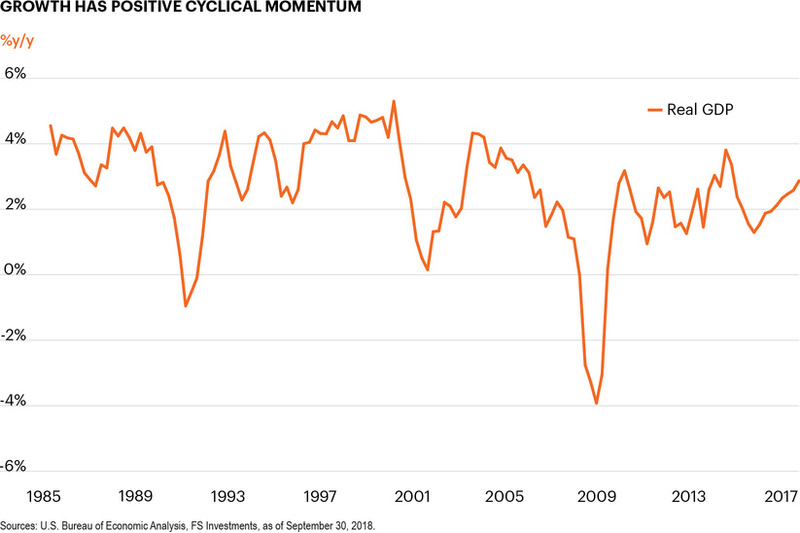 Recent strong cyclical momentum looks set to continue well into next year, but investors must be cognizant of the late-cycle risks the economy faces. Despite fast-paced growth, low interest rates could challenge investors throughout 2018 and beyond. Real GDP growth has trended lower over the last 50 years, caused primarily by slowing labor force growth and productivity. Positive cyclical momentum, including tax reform and fiscal spending, has pushed growth well above underlying potential in 2018. Optimism is high that this will continue well into next year. Yet the gravitational pull of structural headwinds is powerful, and over the long term we believe investors may need to prepare their portfolios for a lower-for-longer growth environment. 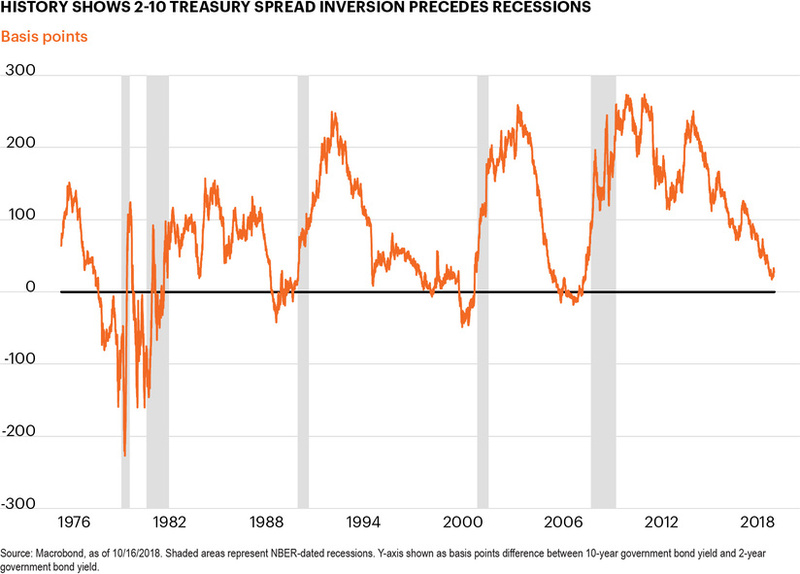 The shape of the yield curve, as represented by the spread (or difference) between the 2-year and 10-year Treasury rates, has been an important indicator of past recessions. The economy continues to add jobs at a blistering pace, averaging 208,000 new jobs per month so far in 2018.1 This has pulled the unemployment rate down from 4.2% a year ago to 3.7%, well below the Fed’s estimate of the equilibrium rate of unemployment. The challenges imposed by long-run demographic trends have not changed, however, and the labor market could increasingly be a headwind for growth in more ways than one. There is some evidence that labor scarcity in the construction and transportation sectors have already hindered output. We will be watching: The monthly payroll report remains a key market focus. As the labor market continues to boom, the Fed has been forced to continuously revise down its unemployment rate projections, and for the time being seems resigned to tolerating levels of employment well beyond what it considers to be the inflation-generating equilibrium. Nine states now boast an unemployment rate below 3.0%.2 However, as a practical matter, the pace of job gains will likely have to slow to reflect the dwindling supply of the working-age population. With productivity still low, a slowdown in hiring would likely coincide with a slowdown in growth. Risks to our view: The gradual pace of Fed rate hikes could change quickly if broad-based wage inflation rears its head – a risk when the unemployment rate is low. 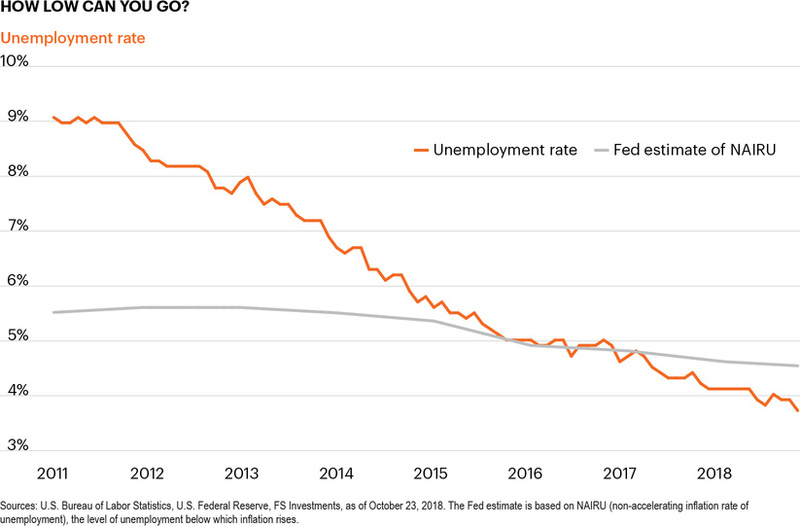 Should the tight labor market spark a brushfire of inflationary pressure, the Fed may well raise rates faster and further than is currently anticipated in an effort to slow the economy down. The risk of a classic Fed “overshoot” would rise notably. 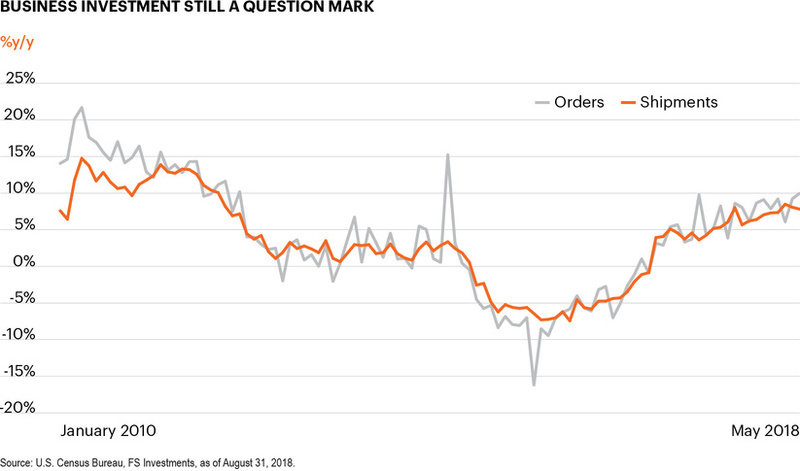 We will be watching: Monthly durable goods orders and shipments data offer a timely indication of whether businesses are investing in capital equipment. The Tax Cuts and Jobs Act has cut the corporate tax rate from 35% to 21% and altered tax-exempt timing on depreciation to incentivize investment spending. This lineup of pro-business news has created a swell of anticipation that business spending will improve markedly. Risks to our view: Businesses could continue to decide that buying back shares and acquiring companies are better uses of tax-cut savings than capital investment. Stock buybacks hit their highest level on record (over $190 billion) in Q2,5 while trailing-four-quarters M&A activity has more than doubled since 2013. It is still too early to make any judgments on the ability of the tax bill to spur investment, but we will be monitoring these data points going forward. Potential growth remains structurally challenged, but the U.S. economy is experiencing growth significantly above potential, in large part due to strong U.S. consumption. Consumption accounts for 69%6 of U.S. growth and drives most aggregate demand. But it is important not to take the U.S. consumer for granted. Demographics are affecting consumption, as slower labor force growth means fewer consumers are added to the economy, and the aging baby boomer cohort means less consumption is discretionary. The broad economy often takes cues from trends in consumption. We will be watching: The relationship between equity markets and consumer spending has historically grown due to wage gains and increases in household wealth. Wage growth has been tepid throughout this expansion, averaging just 2.7%, barely above inflation.7 This has meant the consumer has looked to wealth gains to help support spending. At an aggregate level, household wealth has shown strong growth because of asset price appreciation – notably in equity markets. However, equity markets have kicked off Q4 on shaky ground. The S&P 500 is up only 3.1% year to date,8 and volatility has risen markedly. 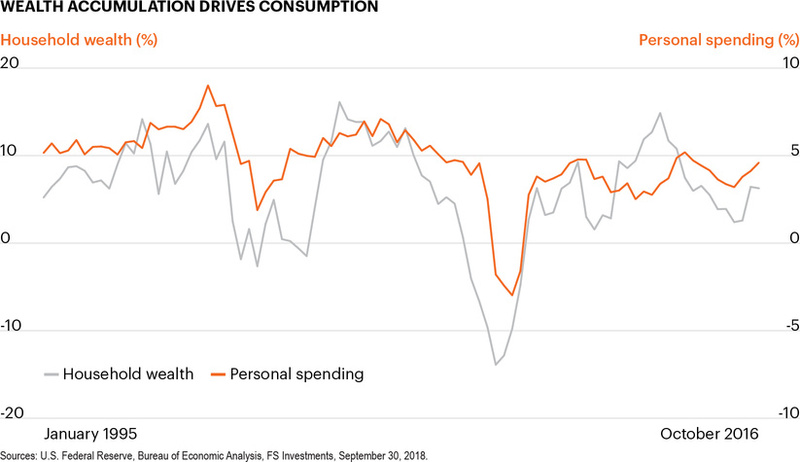 The consumer could exhibit more caution as future wealth gains look more uncertain and choose savings over spending, which would be a headwind for economic growth. Risks to our view: Should wages pick up notably, consumers could overlook rocky asset prices, buffering overall economic growth from the higher volatility in household wealth gains. Slower growth should not be confused with a recession. There is a big difference between slower growth and no growth. The U.S. economy is experiencing positive growth momentum, and pro-growth policies are set to drive growth above current levels into next year. However, in the interest of education, investors can easily follow this indicator, which is a key ingredient of almost every academic model that attempts to predict recessions. The shape of the yield curve, as represented by the spread (or difference) between the 2-year and 10-year Treasury rates, has been an important indicator of past recessions. We will be watching: As can be seen in the above chart, yield curve inversion (when long-term interest rates are lower than short-term interest rates) is often seen as a signal of an impending recession. Even as the Fed has consistently raised short-term rates, yields in the longer end of the curve have not kept pace. On August 27, the 2–10 Treasury spread hit 18 bps, the narrowest it has been since 2007.9 We will continue to watch the shape of the yield curve closely as it has a high correlation to impending economic stress. Demographic structural pressure, contained inflation expectations and low global yields have all put downward pressure on interest rates for years. The increased savings needs of the baby boomer cohort have reinforced the secular decline in interest rates. Yields peaked in the high-inflation days of the 1980s, and today’s lower rates mean investors have fewer options to meet their income needs. 1 Bureau of Labor Statistics, FS Investments, data as of September 2018. 2 Bureau of Labor Statistics, for September 2018. 3 U.S. Bureau of Labor Statistics, based on a 5-year moving average. 4 U.S. Bureau of Labor Statistics. 5 S&P, Macrobond, as of June 30, 2018. 6 Consumption accounted for 69% of chain-weighted GDP in Q2 2018. Bureau of Labor Statistics, FS Investments. 7 Average hourly earnings have averaged 2.7% year/year from January–September 2018. 8 As of October 22, 2018.